I regret that this book sat so long in my to-be-read queue. I regret it because it’s a tremendous read. Mostly this book centers around the author’s thoughts and suggestions for anyone considering starting or joining a writer’s group. I’ve been a part of a few and most of them don’t last long enough to where I’ve felt they’ve been of value. Somebody could have really used this book! Author Hilma Wolitzer writes clearly and with confidence. What she says about writers, writing, and writing groups comes from someone with experience in the craft. Though I am not familiar with Wolitzer or any of her other works, it is quite clear to the reader that she has been here before – seen and done the things she writes about. And all the while there is no sense of being overly dramatic or poking fun at some of the obvious mistakes people make in writer’s groups. She also defines many of the ‘types’ of people that can often be found in such groups and how to deal with some of the potential problems that might arise. Wolitzer’s thoughts on how to critique another writer’s works is tremendously helpful, not just in the sense of being a part of a group, but it’s helpful to the writer in looking at his/her own work. Anyone thinking about starting or even joining a writer’s groups NEEDS to read this book. But it doesn’t end there. The second half of this helpful book is advice to the writer to improve on one’s work. Just as she’s smooth and direct in her advice about groups, Wolitzer is just as direct on her writing advice. She doesn’t write down to the reader. She treats us as though we’re intelligent and already moderately confident in our writing abilities. This is refreshing in so many ways. I can’t say that I’ve read a lot of writer’s help books, but those that I’ve looked at all seem to target the beginner. For instance, when Wolitzer discusses Location in a writer’s fiction she says, “It’s the writer’s challenge to make the surface of Mars familiar and real and the streets of New York new.” This isn’t a ‘how-to tip’ but a reminder of the writer’s job when creating a world (and holds true for the non-fiction writer as much as for the fiction author). Perhaps this is because Wolitzer isn’t offering ‘advice’, with tutorials and exercises … she’s offering observations. Tips that have helped her through certain writing challenges, along with thoughts from other writers. It helps, from my perspective at least, that she mentions and quotes some of my very favorite writers… Bernard Malamud, Anne Tyler, Stanley Elkin. Looking for a good book? 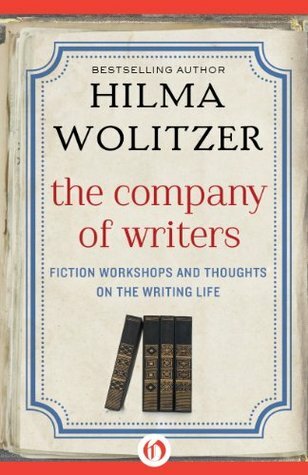 The Company of Writers by Hilma Wolitzer is a must-read for anyone interested in being a part of a writer’s group and is a valuable resource for writer’s.